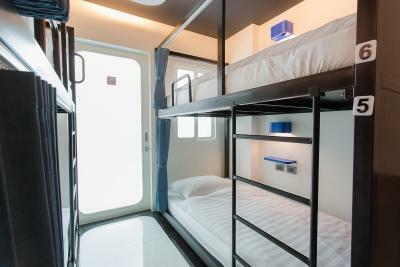 Lock in a great price for BearPacker Patong Hostel – rated 8.8 by recent guests! I stayed here for songkran 12-14 APR every year (water splash in thailand). It is so close and comfortable for walking to Bangla road where is the main of songkran playing area. The staffs are very nice and helpful. The view on rooftop is fantastic. Good vibe. I recommend this hostel. 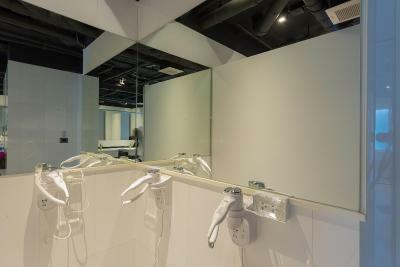 Staff was incredibly helpful, friendly, and created a fun atmosphere for the guests! Love this place and I’ll definitely come back! They have a no footwear inside policy. It's very clean. All! 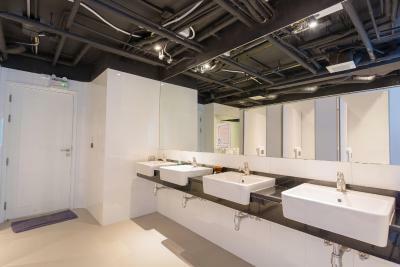 It is simply a very nice, clean and welcoming place! The girls at the reception were very nice and kind to me, the pool with the jacuzzi is just perfect, the food is great, the lounge where you can rest and watch a movie is available all day, it's close to the beach, what do you want more? I have known many places in Patong and without a doubt Bear Packer is PERFECT! I can say that I also had some bad experiences in another place (which I cannot name) but to arrive at the Bear Packer after that hell was my salvation! Staff was really friendly, someone stole my towel and they helped me to solve the problem without paying the deposit, good location, quiet and clean place to stay. I stayed here on two separate occasions during my stay in Patong. 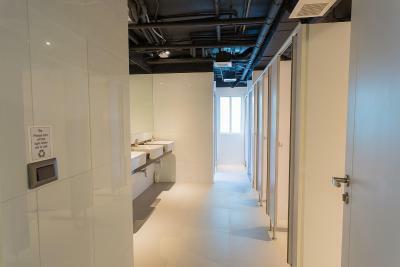 The facilities are new - beds, showers, and toilets which is a good thing. 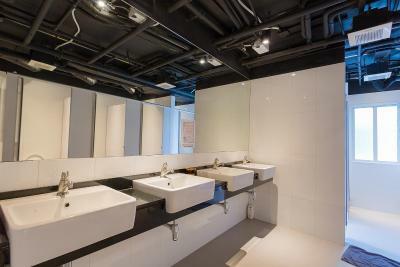 The washroom is also cleaned very often throughout the day and night. Everything was great for a backpacker. The staff were really helpfull with some tour arrangements and general questions about traveling around on the island. Rooftop area.. Nice view where you can see the ocean.. If you like to meet new people from across the globe, just chill at the rooftop, mingle around and you'll get a new friend! 1) Great Location - Stone throw away from Bangla Road and Patong Beach 2) Great Staff - excellent and friendly staff. They promptly answered the questions I had over email prior to my arrival. Fei was an absolutely awesome person! She was very friendly and really helpful! 3) Clean, Nice, and Quiet - The hostel was very clean and neat. 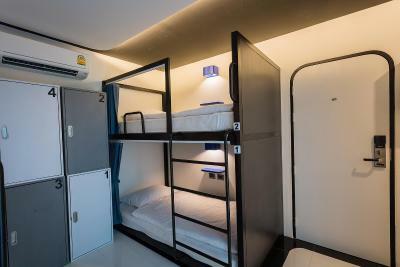 BearPacker Patong Hostel This rating is a reflection of how the property compares to the industry standard when it comes to price, facilities and services available. It's based on a self-evaluation by the property. Use this rating to help choose your stay! 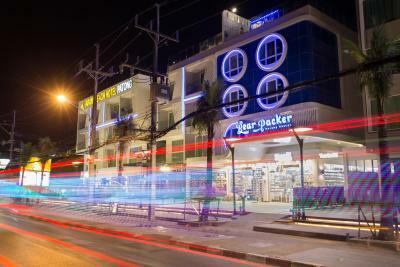 Featuring a shared lounge, BearPacker Patong Hostel is located in Patong Beach, 1.1 miles from Jungceylon Shopping Center. 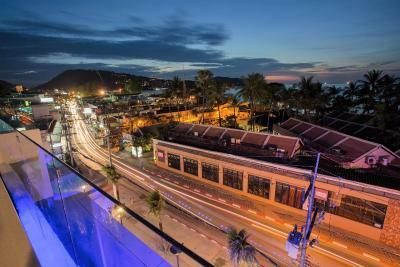 1.2 miles from Patong Boxing Stadium, the property is also 2.2 miles away from Phuket Simon Cabaret. Free WiFi is at guests' disposal. BearPacker Patong Hostel has an outdoor pool. Bangla Road is 2.2 miles from the accommodation. 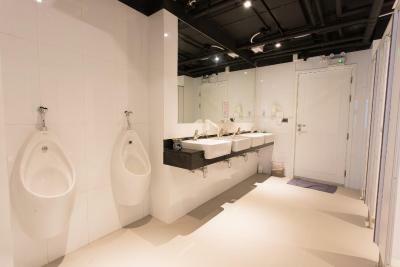 The nearest airport is Phuket Airport, 22 miles from BearPacker Patong Hostel. 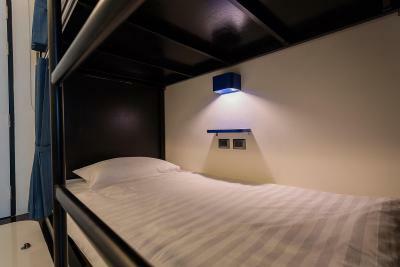 When would you like to stay at BearPacker Patong Hostel? 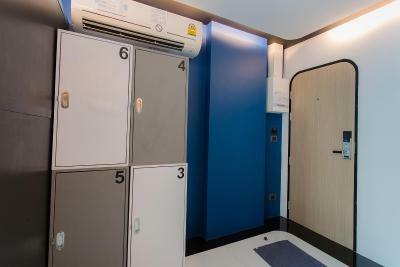 This mini-pod room has air-conditioning and a deposit box. 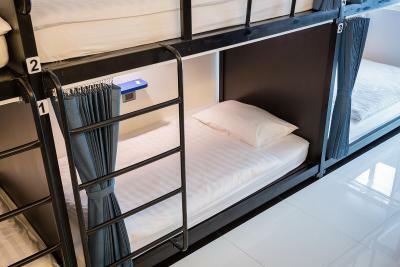 House Rules BearPacker Patong Hostel takes special requests – add in the next step! BearPacker Patong Hostel accepts these cards and reserves the right to temporarily hold an amount prior to arrival. - The hostel is a shoe-free hostel. Guests are not allowed to wear shoes inside the building. - For Dormitory room, the deposit payment of 500THB per person for key card and white towel is required upon check-in (cash only). This can be refundable upon check-out when the item(s) is/are returned in a normal functioning condition. 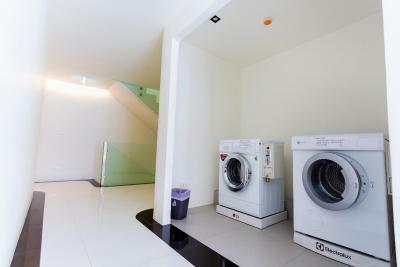 - For Budget Single Room and Deluxe King Room, the deposit payment of 1,000THB per person for key card and white towel is required upon check-in (cash only). This can be refundable upon check-out when the item(s) is/are returned in a normal functioning condition. - Please bring your own padlock. If you want a padlock, it is available for rent or sell at reception. - For safety purpose, visitors are not permitted in the hostel. 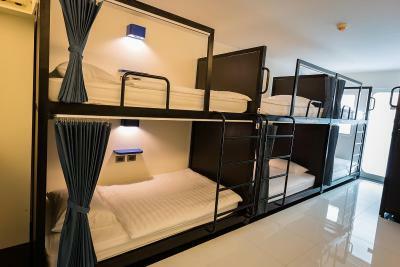 Any unauthorized guests found in the hostel shall be ejected and and additional charges may apply. Please inform BearPacker Patong Hostel of your expected arrival time in advance. You can use the Special Requests box when booking, or contact the property directly using the contact details in your confirmation. 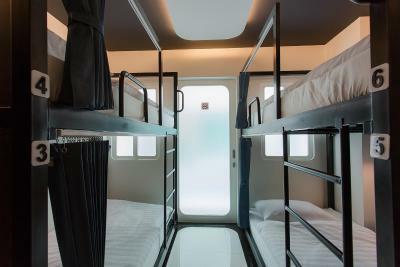 Really clean, comfy bed, so many day trips to book through hostel, fab roof area with somewhere to sit and cool off when the sun got hot. Really secure, the actual hostel and the room. Nice towel for the shower with the deposit. The single room was tiny. Underwhelming for the price. The hostal was always very clean, the staff were very friendly. They have kitchen in common areas but you can not use it without staf. Location. Good wi fi. Clean room and bathroom. Staf. The pool is not that great. You can hear aboslutly every single noise in the room. All doors banging every 1 minute during the day and night, didnt have a single time of peace. Also since the room doesnt have window or ventilation can be Really humid. Not worth the value for money. Wouldnt stay in this "private". Just choose a bed in a dorm. The staff working here is just amazing. Very kind. Can help you with any question. Can offer u some cheap options for tours and something. Atmosphere is very friendly. In the evening guests can just meet upstairs and just chill, talking. Not a very social hostel. No social activities were planned of a night time which made it a little hard travelling alone. 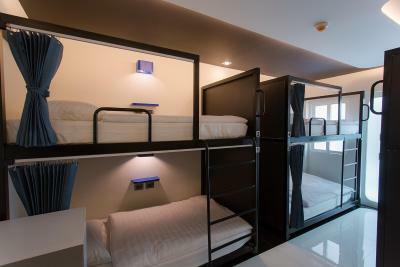 The dorms were very private despite having six beds. I had my own little shelf with PowerPoint and light. Curtains covered like I had my own private room.